The Eiffel Tower neighborhood is one of the quietest places in Paris. The quarter is chic and a bit posh. From the several hotels available we suggest to you some of the best. Who does not want to sleep next to the most famous monument of the world? 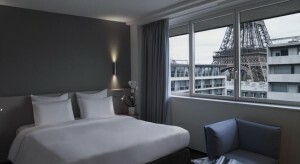 Grand Hotel Leveque is located in 29 rue Cler, just 5 minutes walking from the Eiffel Tower. Along the street you will enjoy its pedestrian area, its bustling market, bars, restaurants and shops. Many monuments are easily reachable from here: Orsay Museum, the Rodin Museum or the Museum du Quai Branly are a few minutes walking from the entrance door. Grand Hotel Leveque is a 3 stars hotel and features 50 rooms with a typical contemporary style. At the ground floor there is a dedicated area for computers and printers and the breakfast room is available from 7.am to 10.30am. The price range goes from 75€ to 150€ the good value for money is guaranteed. Hotel Ares Eiffel is a 4 stars hotel located in 7 rue du Général de Larminat a very quiet street in the center of La Motte Picquet area, in front of the Village Suisse antiques market. The Eiffel Tower and the Champ de Mars are to 5 minute-walk. It has 40 spacious rooms that were renovated in 2007. Their style is mixed with Baroque décor and contemporary furniture giving a cozy sensation in a comfortable environment. Price range goes from 140€ to 450€ per night. Hotel Raphael is located a few meters away from the Arc de Triomphe and it is also reachable in few minutes from the Eiffel Tower. 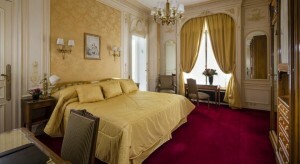 Hotel Raphael is a very romantic and typical old Parisian mansion. 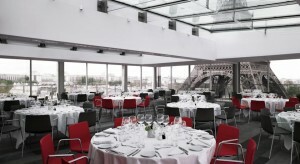 From its suites located at the top floor, it offers an exceptional view on both the Eiffel Tower and the Arc de Triomphe. The interior design is a bit old fashioned and traditional, the wood is included in most of the décor details, and with the ancient mirrors all around, the hotel give you a very warm sensation bringing you back to the beginning of the 20th century. There are not many rooms but all very cozy, well designed and different the one from the others. There are even a few suitable triple rooms for families available. 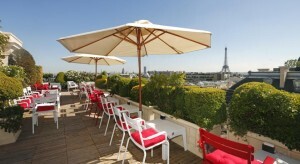 There are 2 amazing suites with their own balcony and a 180 degrees view on Arc de Triomphe and Eiffel Tower. For the anecdote, one of them has been renovated with a special design by Chanel for a film shooting in 2014 and it remained the same ever since. They are simply amazing. 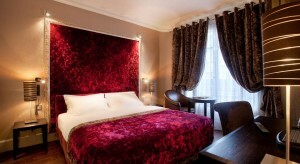 We are proud to place Hotel Raphael in our category of best hotels in Paris. Prices range from 300 € to 2000 € per night. Why choosing the Eiffel Tower area? The 7th district, where the Eiffel Tower is located, is a wealthy district, the home of French bourgeoisie and well-heeled expats. Even though Paris is changing quickly, the Eiffel Tower neighborhood keeps the traditional Parisian style offering insights into the local culture. For instance Rue Cler retains a workday charm with shops for groceries and offers plenty of space for slender stores and their patrons to spill out onto the street. The rue Cler walk is the only tour in Paris you should do while hungry. Cafè du Marché, for instance is an enjoyable place to sit and have a typical French meal, changing every day, the “plat du jour”. Artisan boulangeries are scattered everywhere. Not to mention the Eiffel Tower, which when opened was considered a monster and today is an icon of the city and of French culture. Here the location of our hotels near Eiffel Tower. Why plan your trip to Paris with a package? For all the needs, RATP, the public transport society of Paris, provides you many possibilities of choice for metro tickets in Paris and not only. Single ticket, ticket comprehensive of travel pass to visit Paris, return ticket to the airport or unlimited ticket for traveling throughout the capital. We list for you the different ticket options with unrestricted access to all public transport in the Ile-de-France region. There are available special offers, designed for tourists and occasional travelers. It is a travel card valid for 1, 2, 3 or 5 consecutive days in zones 1-3 or 1-5. The validity period starts at midnight on the first day and ends at midnight on the last day. Based on which zones you chosen, Paris Visite allows you to travel on: metro lines, RER lines,(RATP and SNCF) Transilien SNCF, Ile-de-France, the Orlyval line,(linking Orly Airport to the RER B) and the Montmartre funicular. It is the most complete solution of metro tickets in Paris. Link to RATP website for more information. It costs 11€ and it links “Operà” to “Charles de Gaulle Airport”. It takes 75 minutes and departs in 11 Rue de Scribe – 75009 Paris. The frequency is every 15/20 minutes. It costs 7.70€ and it links “Place Denfert Rochereauto” to “Orly Airport”. It takes 25/35 minutes and departs in Place Denfert Rochereauto – 75014 Paris. The frequency is every 8/15 minutes. It is a train ticket and it costs 9.30€. It links “Antony station” to “Orly Airport”. It takes 6 minutes. The frequency is every 4/7 minutes. From the the open top deck of our buses you can enjoy amazing views. It is a travel card valid for 1, 2 consecutive days for 4 routes and 5 connation points and more than 50 stops in order not to miss anything. Is Montmartre in Paris worth the visit?